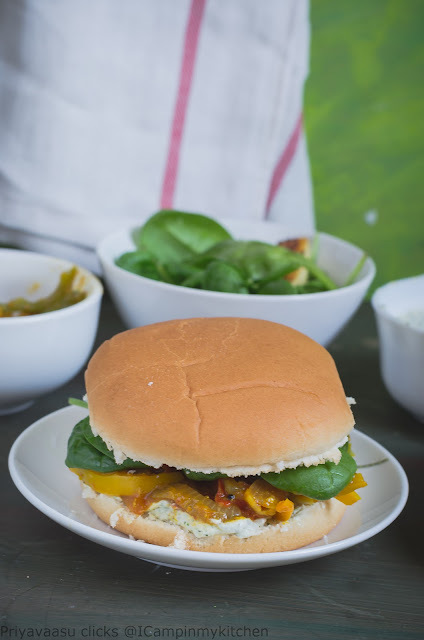 For the last day of Burgers, i m here with a simple bell pepper masala & paneer burger. I was hoping to do another tikki today, but then why it should always be a patty, yeah i know a burgers have a fat patty and cheese, why not a indianized burger with curry and cheese. 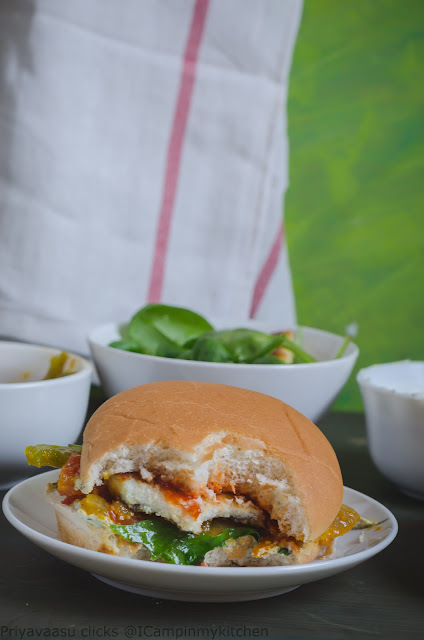 That is how, i made this masala & paneer burger. 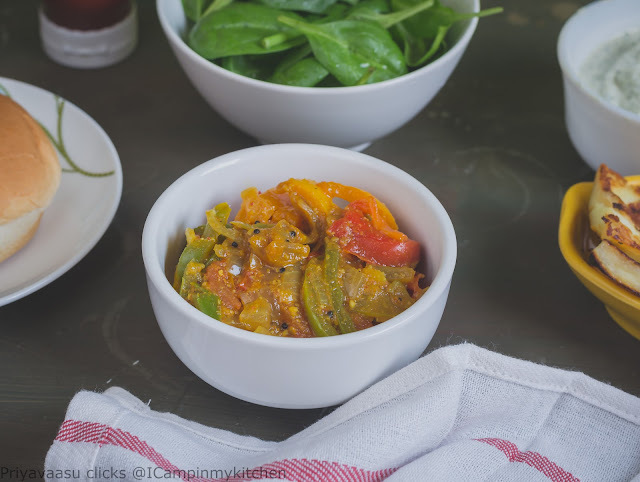 The bell pepper masala is finger-licking good, kids would lick it as such. 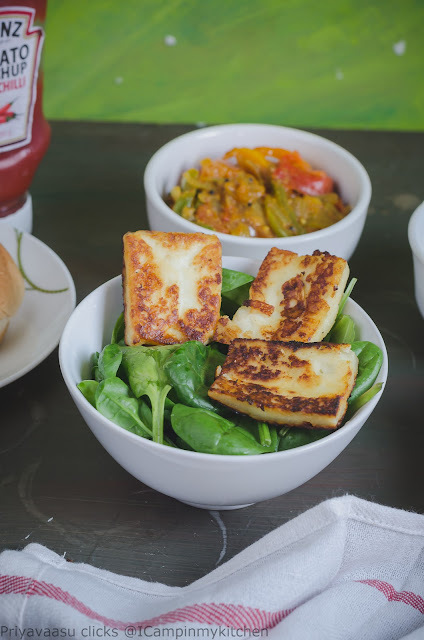 To this i added some volume with pan-roasted paneer, sprinkled with chat masala and fresh, succulent baby spinach leaves. It was one filling meal. For the sauce, i have used the Cream cheese sauce, i made for sweet potato burger. Everything together added a great flavor. Wash the peppers and cut them into thin slices. Chop the onion and tomatoes fine. Heat a wide pan, add a tbsp of oil, once hot, add 1/2 tsp cumin. Once the cumin crackles, add chopped onion and green chili and saute until onions turn translucent. Next add chopped tomatoes, red chili powder, coriander powder, turmeric powder and salt. Add 1/4 cup of water and let it cook, until tomatoes turn mushy. To this add sliced bell peppers and saute. Let this cook for 6-8 minutes, until the peppers absorb the masala. Add garam masala powder and mix well. Remove it from stove. Let it cool, until used in the burger. I used store-bought paneer block. I cut them into thick slabs, got around 7 thick squares of about 1 or 1.5 inches. In a wide pan, add 2-3 tbsp of oil, when it is hot, reduce the flame and place the paneer slabs 2 or 3 at a time. Cook until the bottom browns, takes about 2 minutes in medium flame, flip and cook the other side for another 2 minutes. Remove from the pan, and keep it on a kitchen towel, to remove the excess oil. Sprinkle little salt and chat masala over it for little extra zing. 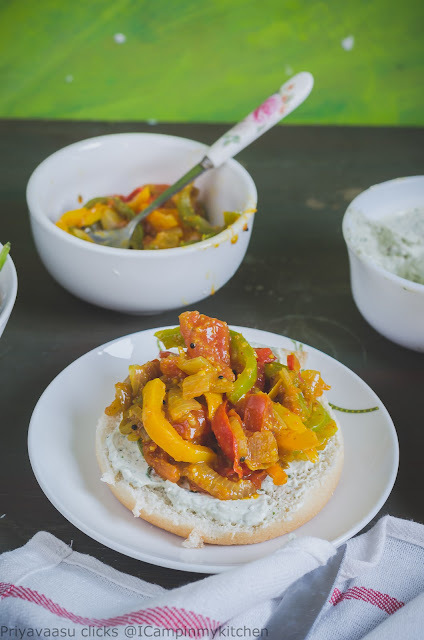 Cut open the burger buns, apply a generous tbsp of cream cheese sauce, place 2-3 tbsp of bell pepper masala on it. 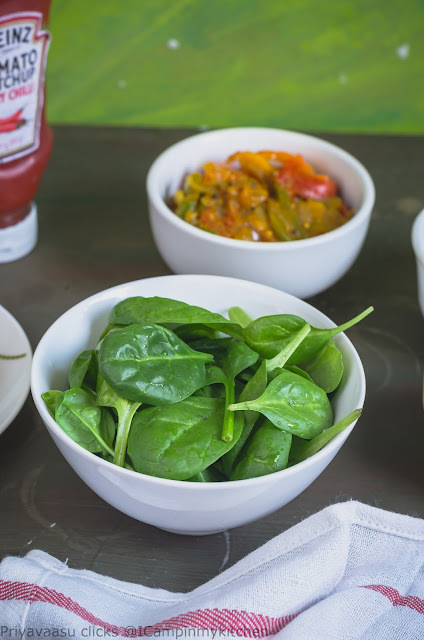 Add a bunch of baby spinach leaves on top, top it with 2 or 3 slabs of paneer, squeeze a blob of fiery tomato sauce, close it with the top slice. Enjoy!!! What a lovely burger idea with that flavorful capsicum masala! wow..that is a unique burger..would love to try it out. 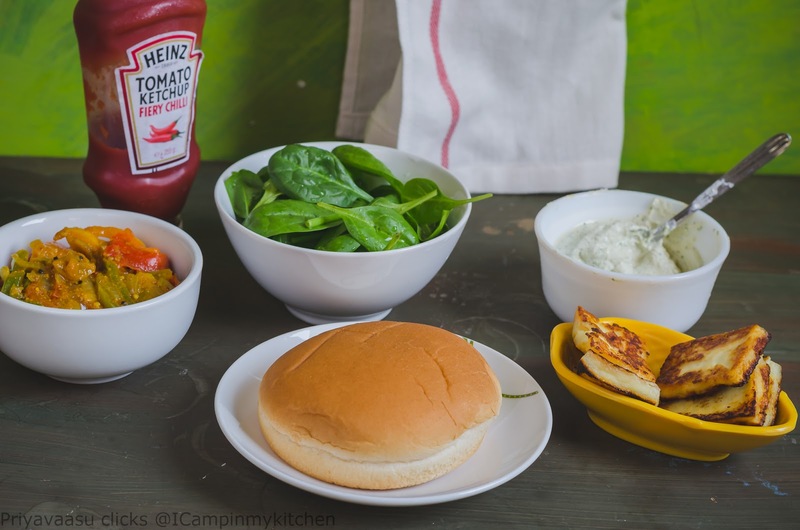 I guess you can have that burger even without the paneer cubes... the capsicum masala sounds enticing! It is indeed a unique burger with capsicum masala and paneer. Next time when i'll make cheese chili, gonna put it in burger bun and serve. Kids would certainly enjoy it. That is an amazing Indianized burger. Super Priya!! 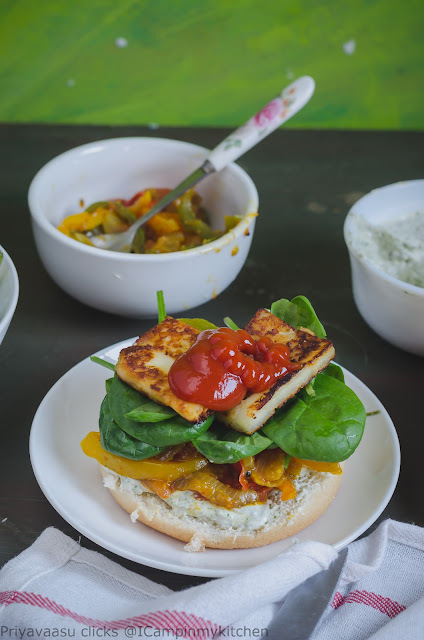 Very unique burger, thats a brilliant idea of going with capsicum masala and paneer. My goodness what a scrumptious burger you got there Priya. 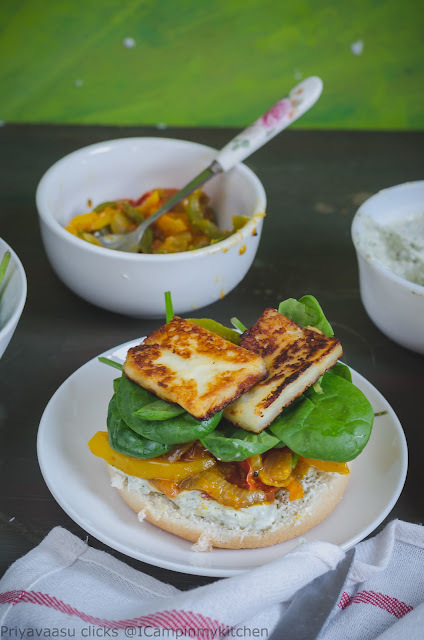 That capsicum masala with the grilled paneer and toppings looks amazing.